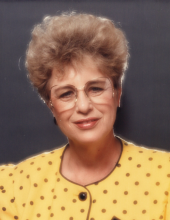 Vickie Jean Dean Crawford, age 77, long time resident of Ponca City, Oklahoma, joined her heavenly father on Tuesday, November 27, 2018, in Ponca City with family and loved ones by her side. A graveside funeral ceremony to celebrate her life will be held at 2:00 pm, Monday, December 3, 2018 at the Odd Fellows Cemetery with Harold Hutchins officiating. Casket bearers will be Tony Vap, Monty Eckler, Shane Bailey, Garrett Bailey, Maison Steelmon, and Wyley Steelmon. Arrangements are under the direction of Trout Funeral Home & Crematory. Vickie was born on May 14, 1941 to Ralph Dean and Dolly Brown Hickman in Tulsa, OK. Her mother later remarried Clyde Hickman who raised Vickie like his own daughter. Vickie was raised in the Ponca City area, graduating with the Ponca City High School class of 1959. Vickie was a young mother who worked very hard throughout her life to provide for her 3 children. Vickie had a colorful career very much like her personality. She worked for Dr. Hudson at the Grandview Hospital and was also a nurses aid at the Ponca City Hospital. She was the first lady to drive an Asphalt Truck for Evans and Associates and served as a dorm Mom at N.O.C. Vickie delivered papers for the Daily Oklahoman, waitressed at several different restaurants, umpired baseball games, and managed the gas station at Hartford and 14th street. She married Donald J. Crawford on June 8 1991. After marrying Don, Vickie was able to retire and care for her parents before there passing. Later her and Don enjoyed traveling by RV to meet up with family in Arizona and avoid the nasty Oklahoma winters. Vickie has been a faithful member of the Osage Heights Baptist Church for many years. She will be dearly missed by her family and friends and forever remembered for her laughter and zest for life. Survivors include her husband Don Crawford of the Home; sister Pat Ferchau of Stillwater; brothers Robert George Dean and wife Anna of Olympia WA, William Jack Hickman and wife Glenna of Albuquerque NM; daughter Kym Vap and husband Tony of Ponca City, Donna White of Kaw City; two sons Monty Eckler of Ponca City, Shane Bailey and wife Heidi of Ponca City; grandchildren Monica Pratt of Ponca CIty, T.J. Eckler and wife Elizabeth of Owasso, OK, Sasha Steelmon and husband Wyley of Ponca City, Lindsey Hobbs of Ponca City, Leigh Ann Gilles and husband Kael of Oklahoma City, Amy Arbona and husband Tony of Ponca City, Freedom Eckler of Nowata, OK, Garrett Bailey of Ponca City, Kyle Albee and wife Calvia of Newkirk, Cameron Albee of Newkirk; numerous great-grandchildren, nieces, nephews, and friends. Vickie was preceded in death by her parents, brother Thomas R. Dean, brother in law Jack Ferchau, aunt Christine Nelson, and nephew Rocky Haag. To send flowers or a remembrance gift to the family of Vickie Crawford, please visit our Tribute Store. "Email Address" would like to share the life celebration of Vickie Crawford. Click on the "link" to go to share a favorite memory or leave a condolence message for the family.